Well it’s happened! Our energy meter is running backwards thanks to 9 solar panels and some wonderful September sunshine. After much research we decided to bite the bullet and fit solar panels. We opted for panels from Solar Europa in Barnsley as they come with individual micro invertors. 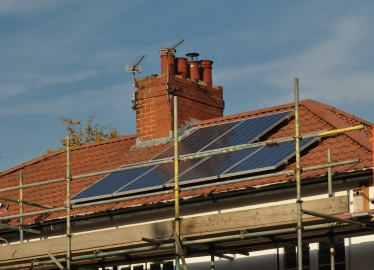 Most current systems come with solar panels connected to one big inverter usually located in the roof space. All the panels operate at the same efficiency – that of the most shaded panel. With micro-inverters each panel works independently at it’s optimum efficiency so you can have them pointing different directions. It doesn’t matter if one is partially shaded or has pigeon droppings on it, it won’t affect the efficiency of the other panels. So yesterday they were connected up and we watched the little wheel in the meter start to go backwards as energy flowed in the other direction. On Monday we hope to have a meeting with the installer who will tell us how to logon to a website which will show how each panel is performing. That should be interesting because at the moment it looks like the three panels on the end of the house perform better than the six panels in the photo! There is a certain feeling of smugness creeping in. We’ve done about as much insulating of the house and changing to energy efficient devices as we can do for the moment (some of our single glazed windows have a lot of life left in them yet), and over the last few years we have used a meter to show us how much electricity we are consuming at any one moment which encourages us to search out the devices that have been left on unnecessarily. This has reduced our energy usage considerably, so the panels seem like the next sensible step. We hope that they will pay for themselves in about the next 9 years and we should see our electricity bill go down. So the economic benefit and the smug green feeling suggest that they are a good investment! This entry was posted in Economics, Energy, Environment, Solar Panels and tagged solar panels. Bookmark the permalink.